Relax and enjoy your journey in a private cabin of between 32 and 40 seats. With more space and dedicated flight attendants, you’ll experience personalised service in an exclusive environment. Sit back and relax in your Premium Economy seat, designed by Marc Newson and built by Recaro. 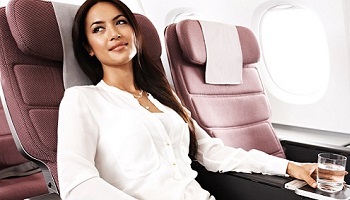 With an ergonomic design, multi-way adjustable headrest and wide seat, you’ll enjoy greater comfort on your flight. Also optimised legroom so you can stretch out while feeling supported by the footrest, which extends from your seat. The centre and side consoles offer extra elbow room, as well as clever storage for your tray table and inflight entertainment screen. You can now choose from the Rockpool inspired International Premium Economy menu (including an online exclusive on certain flights) prior to select flights with Select on Q-Eat. Relax as soon as you’re on board with a complimentary sparkling wine or beverage. During your flight you’ll be able to enjoy a contemporary menu inspired by leading Australian restaurateur Neil Perry, all served on stylish Marc Newson-designed tableware. Also a selection of premium Australian wines that match the menu. You also have access to a selection of snacks and drinks, as part of the continuous refreshment service and self-serve bars, available on the A380 and refurbished B747 aircraft. Put on the noise-cancelling headsets as you enjoy on-demand, inflight entertainment on your adjustable,10.6 inch* personal, touch screen, located in the side console of refurbished B747 and A380 aircraft. Sit back and enjoy hundreds of entertainment options, including the latest movies, TV programs, CD albums, moving maps, interactive games and radio channels. You’ll also be able to place a call or SMS using your entertainment control. Power outlets and USB connectivity are provided on newer aircraft. You’ll receive a complimentary comfort kit to help you stay refreshed. 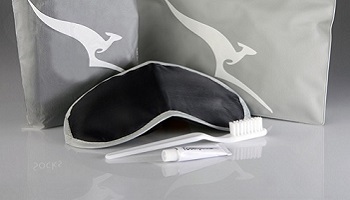 Your handy zip lock pouch contains eyeshades, toothbrush and toothpaste. Socks are available on request. Enjoy a soft blanket and cotton pillow to keep you cosy throughout your flight.